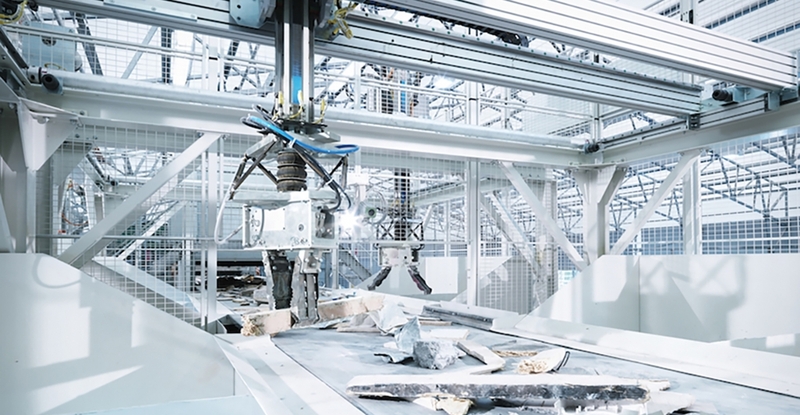 The ZenRobotics Recycler uses robotic arms to reclaim valuable raw materials whilst lowering costs, reducing manual labour, increasing recycling efficiency and increasing the purity of the recycled materials sorted from the waste stream. With two robot arms it can make up to 4,000 picks/hour, compared to a human operative, who on average, achieves around 700 picks/h. Couple this impressive uplift in speed and efficiency with multiple shifts and the result is a dramatic increase in plant productivity. 24/7 waste processing is at last a reality! Blue Group will incorporate ZenRobotics Recycler into their recycling facilities designed by BlueMAC, the plant manufacturing division of the company, located in Ireland. Once incorporated into a facility the ZRR is designed to recognise and recover mixed waste, including metal, wood, stone, cardboard and rigid plastic fractions from mixed C&D and C&I waste streams. The technology is controlled by ‘ZenRobotics Brain’ which utilises multiple sensor inputs in real time, reacts to changes and even learns from its mistakes. The ‘Brain’ analyses the input from a plethora of sensors (metal detector, NIR-near infrared spectral camera, VNIR-visual range spectral camera and 3D) using advanced artificial intelligence (AI) algorithms. It also applies machine learning to combine the data of two physical sensors to create a so-called virtual sensor. ZenRobotics Ltd. was founded in 2007 and is today the world leader in robotic waste sorting systems. Their competitive advantage comes from tedious scientific research and rock-solid product development. The ZenRobotics Recycler relies on artificial intelligence technology in both identifying the valuable raw materials in the waste, and in controlling the robot’s adaptive picking motions. “ZenRobotics is proud to enter the UK market hand in hand with a dynamic market leader. Together we can offer the robotic technology that increases sorting efficiency, flexibility and lowers the operating costs. This positive impact will help our customers to reach the 2020 targets and move beyond.” Says Dr. Mac Borkowski, UK Sales Director at ZenRobotics.